Pitzer College’s Native Initiatives works to provide unique engagement and outreach opportunities between Pitzer students, faculty, staff and local Native American communities. The Native Youth to College Program (NY2C) is a two-week, co-ed, on-campus college life experience for Native high school youth entering 9th-11th grades at Pitzer. It is designed to motivate students to complete high school, promote leadership, strengthen their self-esteem and academic preparation for college, and enforce the connection to traditional knowledge and culture. The curriculum includes academic and creative writing, computer literacy, self-expression through multidisciplinary arts workshops, marine science, health science & careers, and more. Indige-Nation Claremont Scholars provides mentorship and support for Native youth who are in the process of applying to colleges. Claremont College students either drive to partner sites twice a week or groups come to the Colleges instead. Partner schools include Sherman Indian High School, Noli Indian High School, and Semillas del Pueblo. The Elders in Residence Program brings American Indian elders to campus for hands-on workshops, presentations and discussions, to answer questions, offer support, or just listen. Our current Elder in Residence is Julia Bogany, Tongva cultural affairs director. If you want to work with Julia on a project, please contact Violet Luxton first! The Tongva Living History Garden is located 15 minutes away from Pomona College at the Chaffey Community Cultural Center in Upland. The Garden explores three distinct eras and their plants of the Inland Empire: the Tongva Era, the Rancho Era, and the Citrus Era. Students can work closely with Tongva Elder Barbara Drake in the garden, learn about traditional Native cooking/medicine, and even research. The Grandmother Garden is a joint project between Tongva Elders Barbara Drake and Julia Bogany and the Pomona Farm. This project is meant to create a space to have Native cooking and medicine workshops on campus with Tongva Elders. 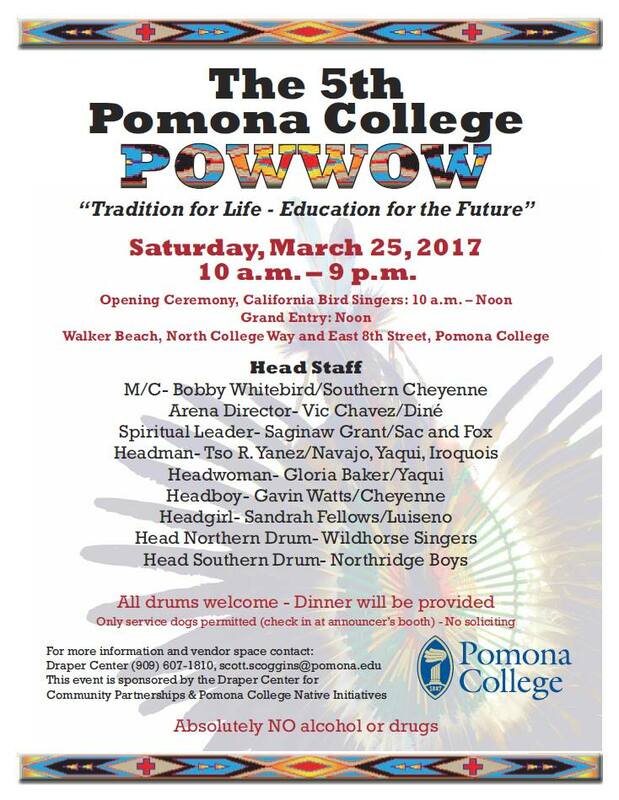 Since 2013, Pomona College has been proud to host an annual Pow Wow on campus. With venders and cultural dancers from across the United States, the Pow Wow is meant to bring our Claremont College and Native communities together for a day of cultural understanding, great food, and entertainment.